In Michael Maier’s brilliant work on alchemy, Atalanda Fugiens, we see the figure of “Numen” of divine nature leading the way with her light, while the alchemist follows behind intently in her footsteps. The caption speaks: “To him/who is dealing with chymics,/ let Nature be reason / experience and reading/ like a guide/ staff/ glasses/ and lamp” I find myself constantly cradled by this idea of energetic influence in my own work as an herbal practitioner, but also provoked by the archetypes in my life, the scholar, the clairvoyant, and the empath. While esoteric devotees of such spagyrical influence emoted on their once ‘radical’ Renaissance notions of balancing the ether with medicine, in the contemporary, it seems to be sown on familiar lands. I would say, what is difficult is translating the tongues of old without sounding like a musty and antiquated archaic. In Numen Naturae: The Magician’s Wand, herbalist Casandra Johns collects a selection of voices from the plant and magick community navigating the conscious divinity of nature. The scope is part of a larger gnosis to be continued to investigate the relationship and cognition between our herbal allies and the established praxis of archetypal imagery. Specifically, the essays explore the correlation of the plant yarrow [achillea millefolium] and the archetype of the Magician from the major arcana tarot. Yet, the text is more than just a dissection of the ceremony of opposites and similarities. I’m reminded of something noted herbalist and naturopath Dr. Jody Noé said during a lecture once, emphasizing plant medicine as an “energetic bridge” between the actual plant and the intuitive discipline of our mind and body. Numen Naturae seeks to ‘activate’ our approach to plant medicine and stimulate the need to resonant a practical, spiritual significance in our own environment. Coming from a strong zine making background, I also feel personal narrative is so important. The stories and rituals of the book complete for me, the trajectory of the Ouroboros. Many times, we in the herbal community we get sided on certain tracks of either clinical and empirical academia or on the verso, unrelenting spiritualism that spends too much time in the ether to prepare us for actual grounding. I suspect, the magick community also grapples with a similar ego. I found the humor and mention of this notion in Eric Purdue’s interview mentioning academia significant. Furthermore, a discussion on any of these aspects that does not mention privilege and cultural appropriation is troubling; in my opinion, so I was grateful to see Jennifer Stickley mention cultural appropriation, as well as Scott Kloos’ bipartisan connection to yarrow. We enter the space humbly, with absolution, a perception gracefully promoted here. Along those lines, as Katharyn Waterfield reminds us to literally ‘pay attention’ to consciousness, as archetype links instinct and cognitive patterns, we also need to be aware that “archetypes are more than a direction or goal, they also provide profound motivation or drive” (Waterfield, 62). This for me has always important, as practice of intention with herbalism. While I find strength in my own inner Magician, the individualism that drives me, I also would not exist without the collaborative experience of perception and dialogue. While I agree our culture “has become disconnected from our sensory experiences, from our somatic experiences” (Stickley, 8), I also know that not every one shares the same experiences, as I, to be mindful, is also to be wise, but to recognize individual narrative and personal privilege is crucial. Yarrow is in my experience is a plant of synchronicity like many of the authors mentioned. I love that. I can remember listening to Matt Wood speak of the specificity and action of yarrow and later in the day, tripping and falling into a patch of yarrow in the high desert of Arizona. 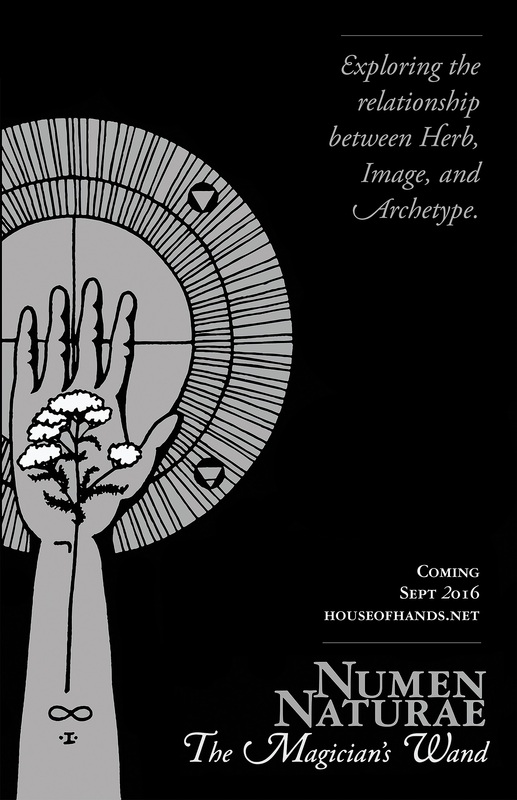 Michael Tierra’s “Herbal Tarot” similarly speaks of the illuminations of yarrow, but represents yarrow with the divine hand of the cosmos clutching the Ace of Wands. In this representation, yarrow reveals insight and simplicity, and in harmony. Admittedly, I am neither a Jungian nor cartomancy scholar, but think readers of Numen Naturae will thrive on the layers of analysis spent with the Magician. The beauty of the community is valuing diversity and interpretation of divinity. “The wealth of the world’s cultural heritage includes myriad means for answering precisely these questions, including the rich tapestries of myth, various rite of passage ceremonies, and the kinds of sacred games collectively known as divination” (Edwards, 121). I think Numen Naturae leaves many discussions open for analogy and builds upon a continuum of thought many will invoke throughout their own practices and mysteries. I cannot stress enough the power of story and the power of listening, the power of participating. I have immersed myself with the stories from many herbalists and magick practitioners, but to plunge yourself into the matrix of direction, is the ultimate extension of action. It lifts your heart and provokes your mind, and importantly, for some puts the self into action. Scott Kloos mentions yarrow, as the arrow of love. This is the perfect example of how the plant is metaphor for all things; we must challenge ourselves with knowing the likeness, the narrative, and the action of the plant. Like the school of thought set in motion by the Arab and Greek physicians, the action of the herb is critical to balance the system (mind and body) of the physiology, as in magick, “May your speech and your words be aligned with your actions and intention” (Ciacchi, 23). Numen Naturae is much like the beginnings of a wondrous ‘alchemical wedding’ to borrow a phrase from a friend. It is both poetically aware and significantly consistent throughout representing variables of intellectualism and practice. We not only need to have the four (or more) sensory relationship with a plant, we also need to embody the experience rationally, respectfully, and transgressively against oppression and with empathy. I am sated with the words permeating the pages in Numen Naturae to cultivate these ideas. Hi Mike! Thanks for your inquiry!